Today, many property owners are understandably concerned by the risk and consequences of flooding. This is due to rising awareness of the effects of global warming and to the widespread flooding problems in the winter of 2000-01. People have become especially concerned by the way in which properties that have not been subject to flooding in the past are now at risk. The extent to which this is due to poor management of local drainage and rivers systems, or to climatic change, is outside the scope of this article. However, whatever the cause, the effect on historic buildings must be addressed. Generally, people in the past were more skilled at positioning structures and managing ground drainage so as to minimise the risk of flooding and water penetration. 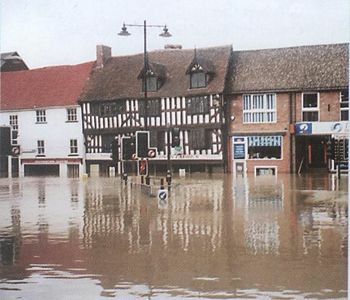 It is therefore not unusual to find that older buildings in a settlement are situated so as to avoid flooding, and that it is the new developments that are affected - all too often because the new development is on land previously used as water meadows or on flood plains. However, historic buildings still can be affected by flooding and it is useful to identify the causes and risk factors so that cost effective remedial measures can be taken. Historically, many buildings were built next to rivers and streams, in order to use the water for transport or power. Many such structures were expected to be intermittently flooded, and those that have survived often include materials and design features that have allowed them to withstand intermittent flooding relatively unscathed. Warehouses, boathouses and mills are examples of this type of building, and areas such as the waterfront of York are commonly affected. Problems arise when new materials or design features are introduced on refurbishment which do not take account of the likelihood of intermittent flooding. In particular, plasterboard, MDF, electrical systems, service systems, floor claddings and furnishings can often be adversely affected. Buildings on coastal sites may be affected by the factors described so far and, in addition, they can be flooded due to breaching of sea defences or 'backing up' of floodwater by high tides. A well-known example of this is London, where the Thames Barrage had to be constructed to prevent flooding. Again, older buildings are often constructed to be resistant to the effects of intermittent flooding or have been built on safer sites; and in London few structures built before the mid 19th century are at risk. Many individual historic buildings suffer flooding due to defective or poorly managed ground drainage. On a local scale, this is commonly due to rising ground levels and defective street drainage, which may allow local surface water to 'run off' and drain into, rather than out of, ground floor or basement structures. Examples of structures at risk can be found in any town or village and even large high profile buildings can be affected. On a larger scale, mismanagement of the river catchment drainage system by the local authority can result in surface and ground drainage water being 'held back' to create unplanned 'flood plains'. This can occur due to poor maintenance and blocking of drains or culverts, but sometimes it is the result of a deliberate policy to prevent flooding in other more sensitive areas. In this way, historic buildings built on relatively high ground can be put at risk by measures taken to prevent further flooding of a larger number of new buildings built on flood plains or water meadows down stream. It is important to remember that many incidents of flooding in historic buildings are due to failures of roof drainage systems or other building services such as water mains. In these cases, water will often flood through buildings, causing damage to structures, furnishings and fittings, and accumulate in porous materials such as masonry, pugging or other insulation. These can then act as 'moisture reservoirs', providing the conditions for long-term damp and decay. This can be a particular problem in poorly maintained and infrequently occupied structures such as storerooms or the unoccupied parts of buildings in multiple occupation. The most catastrophic example of building failure causing flooding is fire. In this case, many thousands of litres of water may be used in fire fighting, and further water penetration occurs afterwards due to damage to roof drains and services. As a result, around four times as much damage is often caused by subsequent 'flooding' than is caused by the fire itself. Careful enquiry and site investigation should identify some of the risk factors discussed above. Although some of these can be reduced, for example by repairing or re-detailing drainage, many are out of the direct control of building owners. It can be especially difficult to get municipal authorities to change street drainage and considerable lobbying and political pressure is required to get the responsible authorities to change the way they manage and maintain river catchments. In these circumstances, it is important to check that the building is not 'under insured' and that all the requirements of any insurance policy are fully met. In all cases, it is the responsibility of building owners to adequately maintain their property. They should also take all reasonable measures to mitigate their losses and reduce their risks. There are a number of refurbishment measures that can be taken to do this. The first step in refurbishing flooded or at risk buildings is to reinstate the drainage systems so as to remove water from the structure and foundations. A checklist for this should include ground drainage, surface drainage, soakaways and sumps, if necessary. The latter may be installed without a permanent pump, but should be detailed to allow access in case of emergency. The second step is to identify current or potential 'moisture reservoirs' in the structure so that appropriate measures can be taken to allow long-term drying and prevent damp or decay to vulnerable materials. This is a specialist task, but accumulations of pugging materials, debris or insulation under floors and the build-up of earth against walls are common problems in historic buildings. Almost by definition, most historic structures are inherently durable and are relatively resistant to flooding. It is therefore often cost-effective to remove any non-original materials, fixtures or finishes not required after refurbishment. These can be replaced with a material and detailing chosen to be resistant to water damage and to allow drying. Again, this is an area where specialist advice can be very useful. However, the general principals are to detail drainage, through-ventilate cavities, and to use breathable finishes. Fortunately, our ancestors were well aware of these requirements and excellent results can often be achieved by using original materials or techniques such as lime plasters and hardwoods or original details such as chimneys and cellars. Modern systems, including through-ventilated dry linings and highly breathable masonry paints, are also useful. Finishes vulnerable to damp or fluctuating moisture contents such as wood block flooring, MDF or veneers should be avoided. Cob, clay lump and other forms of unbaked earth wall construction are particularly vulnerable to damage by water. To protect them from damp ground conditions, cob buildings are always built on top of a solid plinth of 300 to 600mm height. Depending on the part of the country, this plinth would be built from the local stone, flint or brick, which for added protection would often be tarred. If the floodwater rises above the plinth for any prolonged period, the cob will begin to disintegrate. To reduce the risk of flood damage, it is important to maintain the condition of the external plaster finish. Where the cob surface has eroded, it should be cleaned down and repaired with a low strength plaster such as 1:3:12 cement/ lime /sand or 1:25 moderately hydraulic lime/sand. Large holes should be filled with rubble stone rather than with new or reconstituted cob, as this would shrink and would therefore not adhere to the old work. Chalk walls, like cob are vulnerable to damp and will soon disintegrate if they become saturated. Again, the plinth and plaster finish should be kept in good condition to offer full protection to the wall. Repairs should be carried out using low strength lime plasters, as described above. Immediately after the flood abates, any water trapped behind the panelling must be allowed to drain out. This can be hastened by drilling small discreet holes in the bottom of the panelling or skirtings. If there has been extensive saturation of panelling, it may be necessary to carefully dismantle it and dry the elements in a controlled way to avoid distortion. The advice of a specialist should be sought, and it may require permission from the conservation officer at the local planning department. When wood becomes damp, it swells. Oak boards or blocks swell by one per cent of their width for every three per cent increase in moisture content below fibre saturation point (30 per cent). Therefore, if the boards were installed at ten per cent moisture content and they attained 25 per cent moisture content, they could be expected to expand five per cent in width. Over a four metre wide floor, this would amount to 200mm expansion. The length of the boards would not alter significantly. Hence, when timber floors are saturated, they expand and buckle upwards. If a flood is expected, it would be worthwhile to remove the occasional floorboard across the width of a floor to allow this expansion to occur without causing permanent damage to the boards. Even after the flood, if the immersion has not been too prolonged it may not be too late to prevent such damage. If the flooring does buckle upwards it will have to be taken up carefully and stacked, preferably in-situ, allowing air to both sides of each board until they attain their normal ambient moisture content for that interior under normal conditions. If the boards have cupped excessively they will have to be replaced, though minor cupping may be acceptable with a historic floor. If it is not of great historic value, re-sanding the floor may be worthwhile to level the surface. Modern services often represent over 30 per cent of the cost of any refurbishment and these can be especially vulnerable to flooding. Repair or replacement of services can also cause damage to the historic structure. Particular care should therefore be taken to design and install systems that will be as resistant to flooding as possible. Electrical systems can be surprisingly resistant to damage from flooding if not exposed to persistent damp. However, it is useful to install wireways and fittings above floor level and as high as possible within any structure. Special care should be taken in detailing conduit ducting or trenches below floor level, so as to allow drainage and drying in case of flood. Heating systems can make a big difference to the speed with which a structure can be dried, and the eventual cost of refurbishment. 'Wet' central heating that can be run in damp conditions can be very useful, especially if underfloor heating elements are installed. However, the latter can give problems if laid in a porous insulation and, as in all cases of accelerated drying, expert independent advice is required to ensure cost-effective drying and minimum damage to original materials. Backing up and overflow of foul water and sewage systems are a not uncommon consequence of flooding. The decontamination works required then have a significant effect on the cost of refurbishment and the length of time to re-occupancy. The installation of additional breather vents and manholes may reduce this risk, and detailing of access and drainage to under-floor spaces or cellars can reduce the cost of decontamination. It is also important to cheek that the system conforms to all building regulations, British standards and bylaws. There are a number of measures that are commonly specified by specialists such as H+R after massive water ingress into a structure subsequent to flooding. These improve drying and reduce the time required before refurbishment and re-occupancy can occur. The general principles are laid out below in order of priority. It is essential that the higher priority measures be undertaken before those lower down the list. Failure to do this will make the works undertaken at best ineffective and may even make them counterproductive. Detailed specifications for these measures and advice can be provided in each case. Drain water clear of the structure and, if required, prevent further water penetration by the use of temporary roof and ground drainage systems. Remove* all damp materials and debris from the structure, including all damp furnishings, fittings, carpets, rubbish, damp infill and collapsed building materials. Demolish* or otherwise remove* all parts of the structure not to be retained on refurbishment. In particular, remove any damp plaster, masonry masses or floor infills. Provide through-ventilation to all parts of the structure, including all structural cavities such as sub-floor voids, chimney stacks and wall cavities. Fix all doors, cupboards, hatches and windows in a partially open position. Identify all moisture reservoirs in the structure by calling upon a specialist surveyor. Wherever possible, remove* all impermeable finishes from moisture reservoirs.Strip* all water and salt damaged plaster and finishes to expose the structures behind. Detail refurbishment of the buildingto include moisture sinks, such as through ventilated dry lining systems, permeable or microporous finishes and structural heating systems, so as to allow continued drying during and after refurbishment The advice of a specialist surveyor should be sought. . If required, consider the installation of accelerated drying machinery. The use of high capacity desiccant dehumidifiers, tenting and fans is recommended, as specified by an independent specialist surveyor. Consider the use of heating and mechanical ventilation systems. Note that effective accelerated drying requires much management time. *NB If the building is listed, listed building consent may be required for these works and the advice of specialist surveyors should be sought. Floodline - if you live in England or Wales phone 0845 988 1188 or visit the Floodline website (www.environment-agency.gov.uk) for detailed flood warning information for your area and advice on emergency actions in the event of flooding. Floodline is operated by the Envirornment Agency which is responsible for issuing flood warnings and arranging flood defence in England and Wales. In Scotland, this responsibility lies with the local authorities. Local authorities are responsible for flood response during and after flooding. Consult the local phone directory or Yellow Pages or dial Directory Enquiries for the correct phone number. Local authorities will also advise on emergency accommodation. If the property is a listed building, the local English Heritage office should be able to advise on its repair and restoration. TIM HUTTON is the Managing Director of H+R Environmental Investigations Ltd and he has provided specialist advice afterfire and flood for over 15 years to property owners, insurance companies and loss adjusters, including The Royal Household at Windsor Castle. CHRISTOPHER MARSH is a senior buildings surveyor with H+R Environmental Investigations Ltd and is a qualified architect. One of his specialities is the analysis of the moisture content of building structures and the provision of consultancy on drying.